The Progressive Constitution of India has highlighted the right to life as a fundamental right which inalienably belongs to very citizen. But the Kerala State is poverty stricken and is handicapped in terms of human rights and is medically backward because of the plurality of distressing diseases and paediatric and geriatric infirmities. The founder of this magnificent institution was Dr. P. A. Verghese, whose name will ever shine since it perennially radiates in multi dimensional departments of medical therapy. Of course, this hospital small in its beginnings has flowered into one of the finest institutions in the state today. This City is highly over-polluted and filthy in its environment (its drains, water, air and streets) and with highly accident prone roads requires health facilities far more than available now. But the Medical Trust Hospital is one of the finest and goes a long way to help the helpless, unhealthy, backward section which on account of genius of the Founder Dr. P. A. Verghese has therapeutic services into a remarkable healing institution as a blessing of the unhealthy city. Under splendid and successful management, the hospital has made big contribution to progressively transform the pathological misfortunes of Keralite into a hope and haven today. Kochi, the Queen of the Arabian Sea is a rare wonder, but its roads become killing fields often. The haven and hope of those victims is that great medical wonder the Medical Trust Hospital. My great tribute to the Medical Trust Hospital Team, whose healing talent to every ailing victim is a medical panacea and socialist secular excellence. I salute you and may it be given to you and your team to hold high the flag of public health of the Kerala humanity. My father T. Joseph was admitted to your esteemed hospital, amonth back with acute chest infection and breathlessness. Considering his age, 87 years to be exact, his chances of survival were very sim. But the care ans attention that he recieved at the hospital was exemplary. Gradually he began to respond and was discharged after few days. To me and my family, this was truly a miracle and we owe our gratitude to the entire medical faculty who was there at all times and especially mention the wonderful wonderful services of the nursing staff. They were truly selfless, caring and admirable in their approach to my ailing fathe who gave them immense trouble. 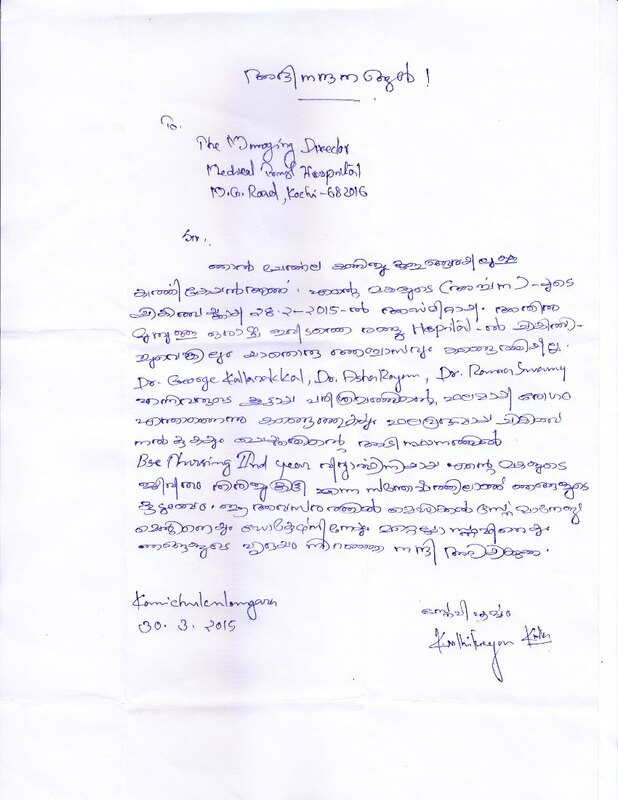 From my experience, I would like to briefly express my opinion about Medical Trust Hospital at Kochi. The feedback form given from the hospital restricts the grading of various activities to the extent of ‘Excellent’ only whereas it really deserves much higher degree of appreciation if it is evaluated more closely. Thus I feel it apt to testimonies that the ablest doctors and the nicest well behaved and kind hearted nursing staff members together are truly wishing to reduce suffering and promote welfare of mankind with their professional expertise, wide experience derived from hard work and by a will to leave no stone unturned to satisfy the patients, indeed getting good relief pleasure and happiness. This achievement has also enabled the hospital to earn the deserving name and fame, popularity and a stable standing amidst tough competitors around. The cost of treatment is relatively low and is affordable to all sections of people. Yet the hospital strives hard to live up to the patients expectations at minimum expense, it is obvious. The role of the management too is praiseworthy in the whole set up. I am writing to express my sincerest gratitude to and appreciation for the members of your staff who cared for me during my recent stay at your hospital. The professionalism, attention, concern, interest and sincerity toward my well-being and comfort was genuine and expressed by you and all your staff. You and your staff were amazing and I could not have asked for better care. Your staff's are knowledgeable and very experienced. The whole procedure was painless and I appreciate everything you and your staff did to make the surgery a pleasant experience. I couldn’t have picked a better place to have my surgery. I’m doing very well and progressing quickly. I got back to Kuwait a month ago and have resumed work. I’ve finally taken the dressing off and feeling good as new. Please extend our deepest appreciation to all of your staff's for the wonderful care I received while at your hospital. I don’t’ think any words could possibly be adequate to express my feelings or gratitude to you. Thank you very, very, very much. This is to affirm that my wife Mrs. Marin Joseph (Mary) was having imbalance while walking and was admitted to Medical trust hospital on 26th May 2018. As per the advice of Dr. Jacob, patient had undergone a thorough check-up and Dr. Venkitesh had diagnosed that the patient is having Meningomia and needed to go for a surgery. As per doctor’s advice patient was taken for surgery on 31st May 2018 under the expert supervision of Dr, Venkitesh and team which took around 6 hours for surgery. I take this opportunity to express our sincere thanks and gratitude to Dr. Venkitesh, his team doctors and staff members who took care of my spouse during her sick period. Once again my wife, myself and my children would like to express our utmost thanks for Dr. Venkitesh & Dr. Jacob, staff members, nurses for their dedication & devotion to getting back my wife to normal condition thereby giving us relief.